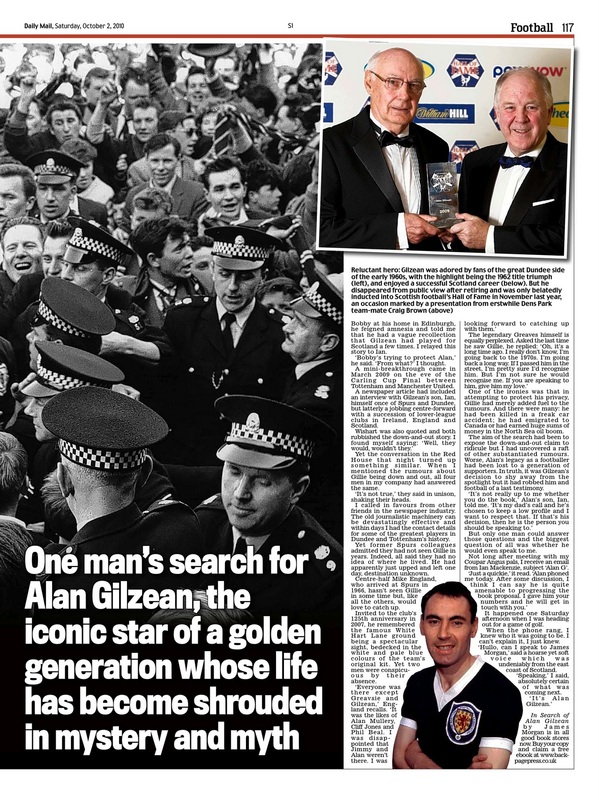 All manner of emails and letters have reached me since the release of In Search Of Alan Gilzean. All have extolled the virtues of Gillie as a player and each correspondent has expressed his/her genuine affection for the man. One, David Potter, the eminent Celtic historian, author, and a Perthshire contemporary of Gillie's, felt moved enough to write a review of the book "for anyone, if you want" and I have enclosed it below. This is not meant as self-congratulatory praise but rather to answer the accusation by another reviewer that the book does not go far enough and that I was "disappointed" that I did not get the answers I wanted. Let me be clear: I was not disappointed by how my search ended. It was, after all, something that could only be controlled by how events unfolded and the journey was only a part of discovering Alan Gilzean, the man. The search was two-fold: it was a physical search and a figurative one. The outcome is what it is. And, anyway, as I have said previously in this blog, many of the answers about what happened next are there but they will not be picked up by reading the book with a superficial eye. They have not been spelled out and with good reason. There are some books that football fans really must read. This is one of them. 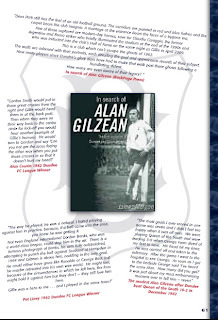 The author, a lifelong fan of the Cockerels of White Hart Lane, has decided that the well known recluse Alan Gilzean must be tracked down and given due credit for what he achieved. He did indeed achieve a great deal, did Alan, but there now remains a danger almost half a century on from his floruit that his memory may begin to dim. Indeed there are now some in his native Coupar Angus who have not heard of him, and with his old club Dundee (not for the first time) in danger of extinction, there is a chance that Alan's contribution may disappear as well. This book is therefore a timeous attempt to redress the balance. 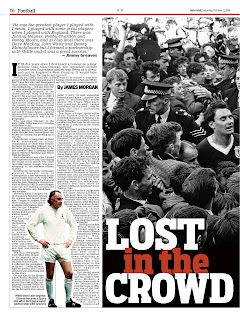 The high point of his career to Scottish eyes at least was the goal that he scored at Hampden on the rainy day of 11 April 1964 to beat England 1-0 and secure a hat-trick of victories over the "Auld Enemy", but to London eyes of course, he was the King of White Hart Lane, and the author has been very diligent in tracking down Gilzean's team mates to talk about Alan. A complex character emerges. Contrary to what has been said elsewhere, Gilzean did not really have a drink problem (others did, of course) although he liked a drink and had a few "moments". He was not necessarily the keenest "forager" for the ball, for he felt that his job was to score goals. 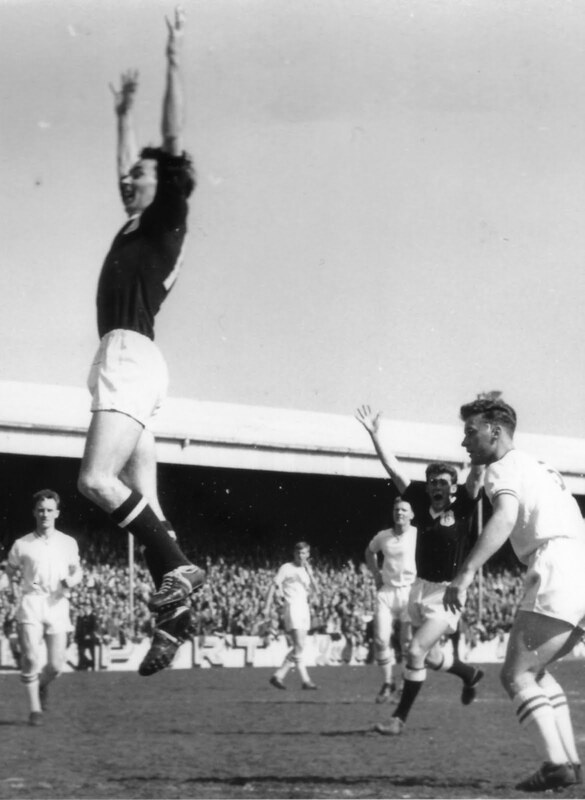 He had a particular dislike of Bob Wilson, not because he was the Arsenal goalkeeper, but because he was a "fake" Scotsman who, Gilzean thought, became Scottish when it suited him to win a Scottish cap. The Dundee days are well documented with emphasis on his great performance in the Ibrox fog of November 1961, the game that really convinced folk that Dundee might just win the Championship. They wobbled a bit near the end, but eventually did it, leading them to an eventful run in Europe the following year. Maybe he should have stayed at Dens, or perhaps held out for a transfer to Rangers or Celtic, but to England he went in December 1964 (after a prolonged wrangle with Dundee which did not reflect well on anyone), and teaming up with men like Jimmy Greaves and Martin Chivers, became the legend of Tottenham Hotspur. The author compares him with Berbatov. 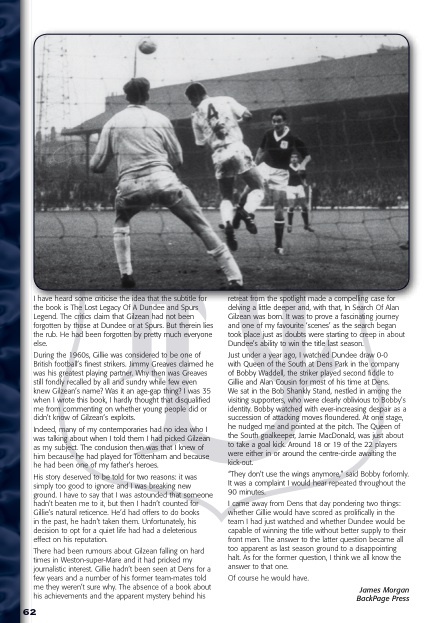 Gilzean, in my view, was a lot better. 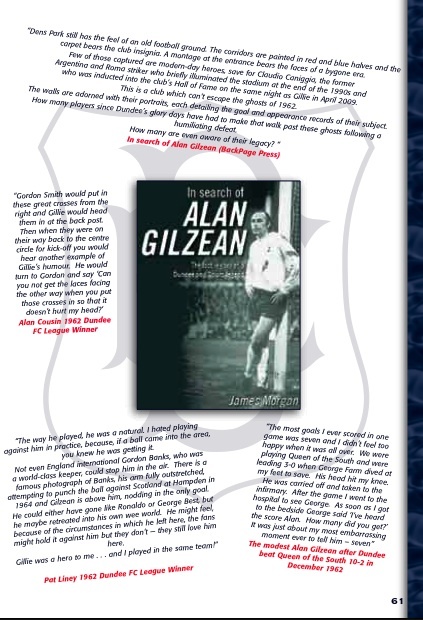 The book leaves a few questions unanswered, questions that will possibly never be answered, simply because Alan Gilzean does not wish to answer them. He is entitled to his privacy, but this should not deflect us from glorifying the great man that he was. The author has done an excellent job in this respect, and at £9.99, the problem of what to get for Dad's Christmas has now been solved. Any self-respecting Dundee or Spurs fan must have this book, as indeed should anyone who likes football nostalgia. For Dundee fans, nostalgia is about all that they have left. Received an envelope stuffed with cuttings from Bill Hutcheon, the editor of the Dundee Courier and Advertiser. There are no match reports just news articles and interviews from titles across the DC Thomson network. 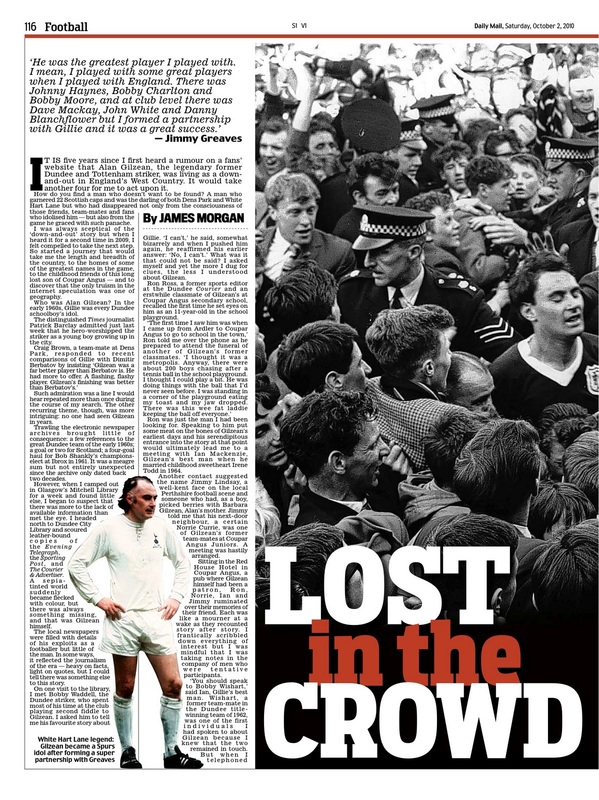 A three-part series of interviews, which appeared in The Weekly News in the early 70s, is particularly insightful and speculates that an anti-Anglo bias explains why Gilzean won so few Scotland caps. 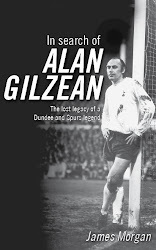 This is intriguing because Gilzean suggests in Kenny Ross's book that there were two reasons why he left Dundee for Tottenham: the first was financial, the second because he feared his international career would suffer if he remained at a club which enjoyed sporadic success. 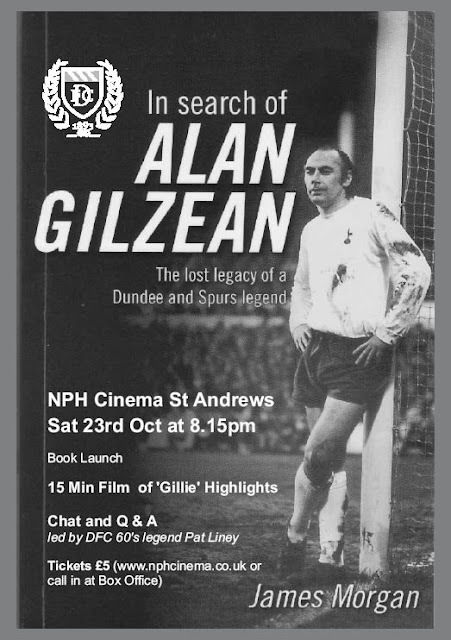 Another notable gem is the revelation that Gilzean is not Coupar Angus's only famous son. Dr John Bain Sutherland, who after emigrating to America as a teenager in the 1920s, went on to become one the most successful coaches in American Football history as a coach of Pitt University, the Brooklyn Dodgers and the Pittsburgh Steelers. His portrait is hanging in the town's council chambers on the day Gilzean is presented with a watch for scoring the winning goal against England at Hampden in April 1964, a victory which sealed a hat trick of Scottish victories over the Auld Enemy. I've ramped up my research on the back of reading Kenny Ross's book. I went to the Mitchell Library in Glasgow today to look at their back catalogue of Herald newspapers. There are a number of articles of interest from the 1961-62 season. The first concerns a supporter who died in police custody after scuffles involving Dundee and Celtic supporters after the sides' league meeting on November 4th. In an outside column at the foot of the sports pages the newspaper reports that a 20-year-old Celtic supporter, Peter Richard Gilroy, had died in custody after being arrested following one of the incidents which followed the Dundee-Celtic match at Dens Park. Gilroy from 15 Porterfield Road, Renfrew passed away at Dundee Police Office. Mr James Clark, procurator fiscal, said he was investigating the matter. A post mortem was carried out on November 6th. His family were told of his death on Sunday 5th November after his sister Mrs Ruth Neill went to Dundee to identify the body. 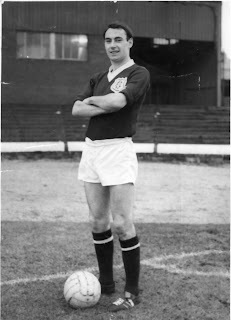 However, for whatever reason, Gilzean wasn't named in the team. The man who lined up at inside left? Rangers' Ralph Brand. It adds significant weight to the idea that there was not just an Anglo-bias but a provincial bias, too. 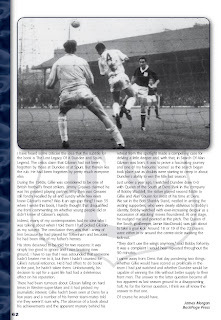 I promised blog followers that I would provide regular updates by way of diary entries that I kept during the writing of In Search Of Alan Gilzean but so far I haven't really delivered on that promise. One of the major challenges in writing the book was trying to juggle the arrival of a new-born son with finding time to get words on to screen. Believe it or not, now that the book is finished the challenge is proving even more demanding. So I've had a rummage around in the attic and blown the dust off a couple of books to give you another flavour of what kind of journalistic endeavours I was involved in just over a year ago. “Have you read the Hunter Davies book The Glory Game?” I tell Ronnie that I have. Ronnie informs me that Ian lives in Carnoustie and I tell him that I will arrange to meet up with him, if and when, I arrange a sit down with Ian. I have a home number for Ian which I had assumed to be an old one but I check the dialling code for Carnoustie and it is the same as the number I have. “Hello?” asks a young voice. “Hello, is Ian there?” I ask. Silence. “It's for dad,” whispers the voice, as the phone is passed to someone else. “Hello,” asks a woman, who has an undeniable east coast of Scotland twang. “Hello, is Ian there? I repeat my question. My heart's in my mouth and it's constricting my throat. “My name is James Morgan. I am a sports journalist with The Herald in Glasgow. I'm thinking about writing a book about Ian's dad and was wondering if he would be amenable to meeting up with me to discuss it.” Amenable? I think, where did that come from? I give my number, hang up and wait. 2.00 I try Craig Brown again. Fortunately, the line is significantly better. He tells me he is driving from Preston, his English home, to Prestwick, where he has a home in Scotland. “I've got a dental appointment in Glasgow, tomorrow,” he adds. It's a good start: if he is prepared to give me small seemingly unimportant details like that, he is unlikely to hold back on other information. Brown proves to be a charming interviewee. From the off, it's clear he recalls Gilzean with a measure of awe but also with genuine fondness. 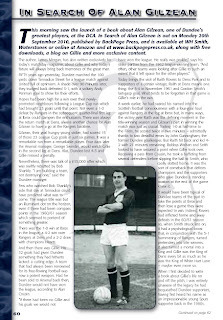 But it his descriptions of Gilzean the player that interest me most. So far, I have read little about what type of footballer he was, although the one thing I'm certain Brown will impress upon me is Gillie's aerial prowess. “He had a great reputation for his ability in the air particularly crosses from the right rather than the left. All strikers have a favourite side and his was the right.” Bingo. Another defeat for Spurs but contained in this video are two exquisite examples of the G-Men in full flow. For children of a certain vintage the name Stretch Armstong will have a particular resonance and at one point in this game Gillie manages to contort his neck into the kind of shape Stretch (a pliable kids' toy) might have struggled with (1.18). Gilzean's reverse flick for Greaves' acrobatic volley (2.17) - which is subsequently disallowed - demonstrates why Spurs fans were so in love with the pairing. There used to be a time when finding out that Tottenham had signed a new player was a surprise. This was an era long before 24-hour, wall-to-wall media coverage, blink and you'll miss it updates and quotes from Harry Redknapp on just about anyone with a pair of fitba boots. Transfers seemed to be so much less protracted in the past: one day said target was another team's player the next day he was your team's and channels for the information were confined to P302 on Ceefax or one of the red tops. It helped, of course, that there was no such thing as a transfer window and clubs could sign players practically all year round. 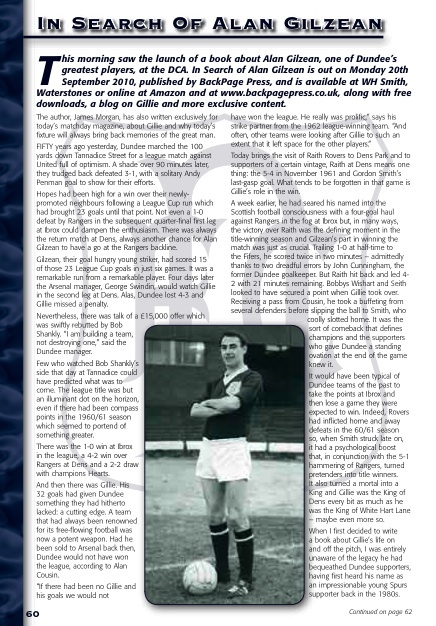 None the less Gillie's own transfer from Dundee to Spurs was six months in the making and turned into a bit of a saga before he eventually signed on at White Hart Lane, a week before Christmas 1964. Two newspapers, the Daily Mirror and the Daily Express, had the story. Another far cry from the present. Now journalists across Britain indulge in a fastest finger in the west style gunfight to see who can be first to pull the Twigger [sic]. And that's if they get the news first. Club websites, both official and unofficial, Sky Sports News, the BBC website and fans forums all vie with each other to be the first to 'break' the news. A recent example was the Efrain Juarez transfer from UNAM Pumas to Celtic. The Mexican newspapers reported that Juarez was all set for Parkhead, the Scottish newspapers picked up the story the following day and by day three the Mexican press were quoting the Scottish press as having said the deal was almost done. It's a long way from the days when Jim Rodger of the Daily Express used to set up transfers for talented Scottish players who wanted to make a career down south and then break the story the following day. Rodger or 'Scoop' as he was better known, was effectively one of football's first agents and helped facilitate Gilzean's move to Tottenham, having been requested to watch him repeatedly by Bill Nicholson. Often times, Rodger would pick Nicholson up at Glasgow central on the overnight train from London and the pair would drive off into the morning mist in search of a potential target. Anyway, in deference to the good old days of blissful ignorance and a time before Manchester City-induced stasis, I've included my five favourite transfers in Tottenham Hotspur's history. Danny Thomas This transfer in June 1983 sums up how things were done back in the pre-agent football world. Thomas was one of English football's brightest young talents and, in the summer of 83, he celebrated a call up to the England national team with a £250,000 transfer from Coventry City to Tottenham. He quickly established himself as one of the best right-backs in the country and won a UEFA Cup winners' medal the following season despite missing a penalty in the shootout with Anderlecht. I loved Danny Thomas as a player. He was quick, skilful and fearsome in the tackle, and he should have had a glittering Tottenham career but for a sickening challenge by Gavin Maguire, the QPR defender. But what I loved most about this transfer is that I found out about it in the pages of Shoot! as a nine-year-old newly smitten with football and especially Spurs. Jurgen Klinsmann Another one which reminds me of the days before the interweb. The summer of 1994 had been a fairly fraught time in Tottenham's history what with a 12-point deducion in place from the Premier League due to transfer irregularities. All talk had been about whether Spurs would stay up ahead of the forthcoming season but it dissipated just as soon as the club made the annoucement that Klinsmann had signed a two-year deal on Alan Sugar's yacht in Monaco. Again what I loved about this transfer was the alacrity with which it took place and the relative stealth with which the deal was done. My brother phoned me at work to tell me that we had signed the German striker - it was the first time I had heard his name even connected with the club. Gary Lineker The England and Barcelona front man arrived at a time when Spurs were on the up. Terry Venables had managed to steer the club to a sixth-placed finish in the previous season (88/89) and with Chris Waddle and Paul Gascoigne starting to click as the campaign drew to a close, the addition of Lineker hinted at the outside chance of a title challenge. All the good work (Lineker cost just £1.5m, a steal given the goals he would score at the club) was undone, however, when Waddle was sold to Marseille for £4.5m a few weeks later. The Geordie would finish second in the European Footballer of the Year awards the following season - an award he should have won. Nevertheless, for those brief few weeks, Spurs fans had the chance to dream again. Jermain Defoe Defoe arrived at Spurs on my 30th birthday in 2004. I thought he was our Ian Wright, a theory that was reinforced to me when the diminutive striker scored on his debut against Portsmouth. That game lives long in the memory. I was with my then girlfriend (now wife) for the game. She had tears in her eyes as the teams came out 'because of the emotion' but by the time Gus Poyet stabbed in Tottenham's winner she was fast asleep. The score? 4-3 to Tottenham. She still refers to JD as 'wee Defoe' but I'm still waiting for him to become 'our Ian Wright'. Luka Modric I was lying in bed nursing a hangover early one Saturday morning when I received a text which simply read 'We've signed Modric'. The Croat had been linked with a string of Europe's top clubs. He had been vaguely linked with Tottenham but it was more or less recognised that his destination would be Chelsea or Barca or some other big hitter. It was almost inconceivable that he would join Spurs. The transfer revived memories of the good old days and gave me an indication of what it might have been like to be a Spurs fan when the club signed Ossie Ardiles and Ricardo Villa. 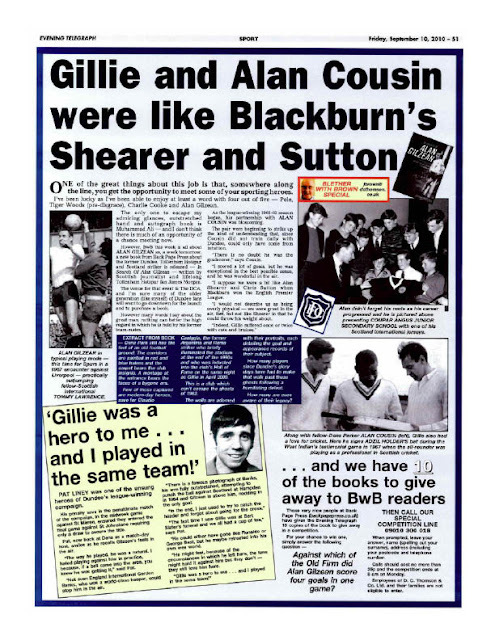 I got to meet Ossie and Ricky during the writing of In Search Of Alan Gilzean. Indeed, they autographed a book for me which I had bought for Steve Perryman for an auction night to raise funds for Exeter City's youth development. Steve being Steve thanked me but told me to keep the book which he signed, too. I intend running a competition on the blog in the near future with the book as a prize. I will, though, insist that you buy a copy of ISOAG in order to enter.